Pick up from your arrival point in Siem Reap ( Bus - / Boat station / airport ), transfer and check in at Ta Som Guesthouse. Welcome drink and cold towel upon check in. In your room, we provide a tropical fruit basket upon arrival. In air-conditioned car, you will be accompanied by our experienced English speaking local tour guide to the Angkor Archaeological Park, UNESCO-World Heritage site since 1992. Entering this once largest city of the world form the South Gate, you admire the road decorated by108 gods and devils. Explore the Bayon Temple and its four-faces statutes (the "smile" of Angkor) and bas reliefs from the 12th century, depicting the Khmer daily life that doesn't seem to have much changed until now. We walk further to the Terrasse of Elephants and Terrasse of Yama (the so- called lepra king) and see the fantastic bas reliefs. In the afternoon, under the sunshine, it is a great time to visit one of the 7 world wonders- Angkor Wat temple. Optional: You can start your visit by riding a balloon (staying at the same place, around 15 minutes!). Great views above the temples. Take your best photo shots! 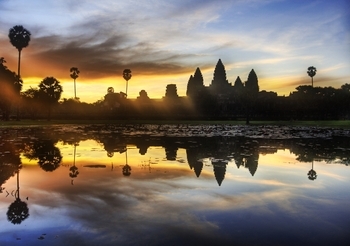 Study the fantastic bas reliefs of Angkor Wat, the largest complex in the world! The reliefs depict scenes of Hindu mythology (like the famous churning of the milk sea). Don't miss climbing up to the third level of this holy place, where once only the Angkorian priests and kings have worshipped their gods. Enjoy the great roundview and take your time for meditation. Sunset from Phnom Bakheng (very crowded but a good spot to see sunset) or Preh Rup, a lovely and quiet place to reflect your discoveries in Angkor. After sunrise, you meet your tour guide and have breakfast (as breakfast box) on the picturesque Srah Srang Water Basin. Enjoy this quiet place, the former royal bath. Continue our journey exploring the most important tempels situated along the "grand circuit", like Neak Pean (holy bath) and the Eastern Mebon (with Elephant statues). On this second day, you should try our traditional beef Loklak, together with a refreshing pineapple juice or tropical fruit shake! After your second day in the temples, you will be certainly tired and you will enjoy our complementary traditional Khmer massage in your air-conditioned room. Relax and reenergize your body and soul for the next days in Angkor! After your breakfast in Ta Som Guesthouse, enjoy your boat trip to Tonle Sap Lake to see the floating village of Chong Kneas. Visit the traditional fish farm and the crocodile farm and learn about fishing techniques and life on the water. In the afternoon, enjoy your journey through picturesque natural landscape with rice paddies and sugar palms in the Northern part of the Angkor Archaeological Park. 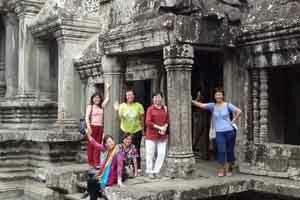 You also visit Banteay Samre Temple. After breakfast, you will be tranported by Capitol bus from Siem Reap on the old Angkorian road via Kampong Thom and Skuon ("spider city") to the capital Phnom Penh. Enjoy your journey of 314 km through the rich farmlands and the scenery of rice fields, water buffaloes and authentic Khmer village life. Check-in Capitol Guesthouse and time for relxation and rest. In the evening, enjoy a romantic Mekong river sunset cruise on a traditional wood boat. Relax on the boat and enjoy great views on the “Phnom Penh skyline” ( Royal Palace, Silver Pagoda, Mekong riverside promenade) during sunset. Visit the Tuol Sleng Museum of genocide, and learn about this sad part of Cambodian history. Continue to visit famous National Museum with the worldwide largest collection of Khmer arts. 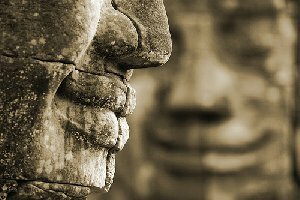 You will see lots of masterpieces of Khmer bronzes, bas-reliefs and sculptures, like the famous reclining Vishnu (from Western Baray) and the stone sculptured head of Jayavarman VII, the most powerful of all Angkorian kings. The Museum gives an excellent overview of Angkorian history and arts and invites you to sum up your visits of Angkor. Our journey continues with the Royal Palace and its highly decorated throne hall, the flowered royal gardens and of course the famous Silver Pagoda. See the model of Angkor Wat giving you a bird eyes’ view of the whole temple area. By our traditional “cyclo” you will be transported from the Royal Palace to the colourful Central Market. This cyclo tour is certainly one of the highlights of your Phnom Penh program. It is the end of our tour program. Boat trip on Tonle Sap Lake at Chong Khnea floating village (on day 3, about two hours). Accomodation for five nights in air conditioned room with private ensuite bathroom with cold/hot water, minibar, Sattlelite TV. 3 breakfasts at Ta Som Guesthouse (on day 2,3,4). Apsara dance show and dinner buffet on day 3 at Kulen II restaurant (6:30pm - 8:30pm). Traditional Khmer massage in your room at Ta Som Guesthouse only (one hour). Transfer to airport / bus / boat station in Phnom Penh. prior or even after this package, the entrance fee for Angkor (ticket) is not included. 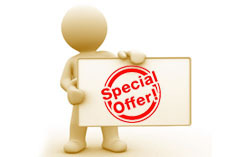 The price for 4 persons is based on accommodation in two double rooms or two twin rooms.